Summoned by the blazing will of the Runemasters and Runesmiters, Magmic Invocations are magical constructs forged of arcane fire that bring death to the foes of the Fyreslayers.In this set, you’ll be able to build a set of Magmic Invocations of your own, allowing you to mater the full might of your Fyreslayers army. Inside, you'll find:- The Zharrgron Flame-spitter, a geyser of molten lava that deals devastating damage to massed infantry- The Runic Fyrewall, a barrier of gold and flame that shields your units from harm- The Molten Infernoth, a raging elemental that rampages across the battlefield, slaying your enemies while leaving the Fyreslayers untouchedFor more information, check out the free warscrolls for these models, available to from the Downloads tab. This kit is supplied in 22 plastic components, and is packed with 1x 120mm oval base. Formed instantaneously from molten metal, the Magmic Battleforge is a reflection of godly power, a manifestation of Grimnir’s fury fused with the white-hot fires of Vulcatrix. This mystic furnace can be summoned to a battlefield, where its elemental heat can ignite ur-gold runes and stoke the powers of the Zharrgrim.The Magmic Battleforge is a piece of terrain available to every Fyreslayers army that increases the power of your Fyreslayers Priests. Costing no matched play points, this towering edifice is a fantastic addition to your collection allowing you to add some Fyreslayers flavour to any battlefield, as well as offering a number of invaluable in-game effects. Your Priests will be able to harness the forge’s powers to assist in their prayers – or use it to better defend nearby Fyreslayers units.This kit builds one Magmic Battleforge, and is supplied in 33 plastic components. Master the might of your Fyreslayers with these easy-reference Warscroll Cards! Warscroll Cards are an invaluable resource for gamers that take your key warscrolls and abilities, and allow you to check them out at a glance. This set also includes a number of tokens for keeping track of in-game effects, meaning you won’t have to worry about trying to remember them! This set contains small-format warscrolls for all the Fyreslayers units, plus the Magmic Invocations and the Magmic Battleforge. Please note – you’ll need a copy of Battletome: Fyreslayers to make use of the contents of this set! Wherever Khorne's followers do battle they raise up Skull Altars – dread monuments from which to offer tribute to the Blood God and receive his blessings in return. Rising from the ground, the Skull Altar is formed out of the violent tributes heaped in offering for Khorne’s Throne.Available at no matched play points cost to any Khorne army, the Skull Altar is a terrain piece that makes your Slaughterpriests even more powerful. When near it, they’ll be able to re-roll their crucial prayer and judgement rolls, allowing you to unleash your favourite Judgements of Khorne or get off key bonuses without a hitch. Meanwhile, nearby Wizards will find it harder to cast spells – Khorne has no time for those who would rely on sorcery to win their battles!This set builds one Skull Altar. Once complete, you'll have enough room on top to mount a Khorne Hero of your choice. Covered in baroque and grisly detail, it’s a great centrepiece to your Khorne collection and incredibly useful in game.This set is supplied in 21 plastic components. When the necroquake shook the foundations of the Mortal Realms, the barriers between the aether and the Mortal Realms were weakened. For practitioners of magic, this meant more eldritch powers were within their reach – for the followers of Khorne, who despise the arcane, it meant they could more easily draw manifestations of the Blood God’s judgements from the Realm of Chaos and send them crashing down upon their enemies.Judgements of Khorne are the Blood God’s answer to endless spells. Summoned into battle by Khorne Priests like the Slaughterpriest, each makes a devastating impact on the battlefield. In this set, you’ll find all the Judgements of Khorne, including:- The Hexgorger Skulls, manifestations of Khorne’s will that mess with enemy casters and rob them of spells- The Bleeding Icon, a symbol of Khorne that can crush foes and make failed battleshock tests even more dangerous- The Wrath-axe, a supernatural blade that cleaves through enemy unitsEach of these Judgements of Khorne is a striking, eye-catching model that’ll stand out superbly on the tabletop, with unusual elements like waves of energy and pools of blood that’ll be a treat to paint.This kit is supplied in 14 plastic components and is supplied with 2 x 60mm round bases and 2 x 105mm oval bases. Ever watchful, ever hungry, Karanak is the physical manifestation of the Blood God’s wrathful vengeance. Once he has the scent of his quarry, this tireless predator will not cease in his hunt until he tastes their torn flesh between his fangs.As a Daemon, you can use Karanak in both Warhammer 40,000 and Warhammer Age of Sigmar. Regardless of which system you use him in, he’s a deadly hero-hunter, who can tear apart even the most durable foe with ease. Capable of denying psychic powers and dispelling magic, he’s great at countering any coward who’d hide behind foul sorceries!This set allows you to build Karanak, the Hound of Vengeance for yourself. This three-headed hound will look great alongside your other Flesh Hounds, or as a striking painter’s project. This set is supplied in 13 plastic components and is supplied with a 75mm oval base. Swift, strong, and tenacious beyond mortal reason, Flesh Hounds run their prey to the ground without mercy. Those who seek to trick or destroy these daemonic beasts with sorcery find their powers flickering to nothing, extinguished by the wrath of Khorne.Flesh Hounds are fast, deadly and especially effective at slaying those who would dare dabble in sorcery. Usable in both Warhammer 40,000 and Warhammer Age of Sigmar, they're excellent for killing your opponent’s favourite characters or launching deadly flanking attacks. This kit contains everything you need to build five Flesh Hounds. Each is armed with blood-dark claws and wears a collar of Khorne.The set is provided in 20 plastic components and is supplied with 5 x 60mm oval bases. Each swing of the Bloodmaster’s blade opens throats and splits torsos, while truly worthy victims find their heads severed from their bodies. Around the Herald, the Bloodletters of Khorne fight all the harder, driven to a frenzy by his murderous aura.Bloodmasters are a must-have in any Khorne army, whether you’re conquering the 41st Millennium or the Mortal Realms. As well as being deadly combatants in their own right, these champions of the Blood God will also make your Bloodletters even deadlier with handy aura abilities.In this set, you'll find everything you need to build your own Bloodmaster. Styled after the Bloodletters he leads, but larger and wearing extra armour, he'll look right at home on the front lines of your army.This set is supplied in 14 plastic components and is supplied with a 40mm round base. Even the most bloodthirsty warlord needs to plan properly – which is where these handy Warscroll Cards come in! An invaluable resource for any Khorne general, this set includes easy-to-reference warscroll cards for all Blades of Khorne and Daemons of Khorne units, plus tokens for keeping track of persistent in-game effects. In short, you'll be able to spend less time flicking through your battletome and trying to remember how many Blood Tithe points you have, and more time shedding blood for the Blood God! This set contains 37 warscroll cards, plus 2 double-sided push-out token sheets. Please note – you'll need a copy of Battletome: Blades of Khorne to use this product! Skulltaker is Khorne’s immortal champion and the greatest of all Bloodletters. Ever seeking worthy skulls for his master, he scans the battlefield for the enemy’s greatest champion, bellowing his challenge before moving in to end yet another storied life.Skulltaker is a savage hero-slayer. Usable in both Warhammer 40,000 and Warhammer Age of Sigmar, he'll make short work of any of your opponent’s champions in close combat, as well as driving your Bloodletters to fight even harder. This set allows you to add Skulltaker to your own armies. 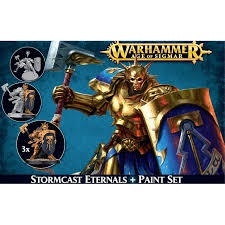 Featuring a classic Chaos aesthetic coupled with the best modern miniatures design techniques, it’s a treat for painters too, featuring all sorts of intricate details – and, of course, a lot of skulls! This kit is supplied in 14 plastic components and comes with a scenic 40mm round base featuring pre-sculpted detail. Kick off your Idoneth Deepkin collection with this specially selected starter set! We've taken some core units every army needs, and put them in one handy set, saving you money compared to getting the models inside separately.In this box, you'll find:1x Isharann Soulrender – a Hero to lead your army who can restore fallen Namarti to life,10x Namarti Thralls – a deadly close-combat unit that carves enemies apart with Lanmari blades, with an optional icon bearer and various aesthetic customisation choices3x Akhelian Guard – assemble yours as unbreakable Ishlaen Guard or lightning-spewing Morrsarr GuardThis set includes 1 x 40mm round base, 10 x 32mm round bases, 3 x 60mm oval bases and flying stands. If you're looking to reinforce or start a Maggotkin of Nurgle army, this Start Collecting! set is perfect! We've taken several staple units of the army, and put them in one money-saving boxed set for your convenience. Inside, you'll find:1x Lord of Blights armed with a bubotic hammer and vermid shield5x Putrid Blightkings wielding a variety of scythes, mauls, axes and flails, including the option of building a Blightlord, Icon Bearer and a Sonorous Tocsin as well as loads of options for customisation2x Pusgoyle Blightlords, each mounted on an enormous Rot Fly, including the option of building one as the deadly airborne Lord of Affliction.This set contains 6 x 40mm round bases and 2 x 60mm round bases. Red eyes and chisel fangs glint in the gloom. A terrible chittering fills the air. 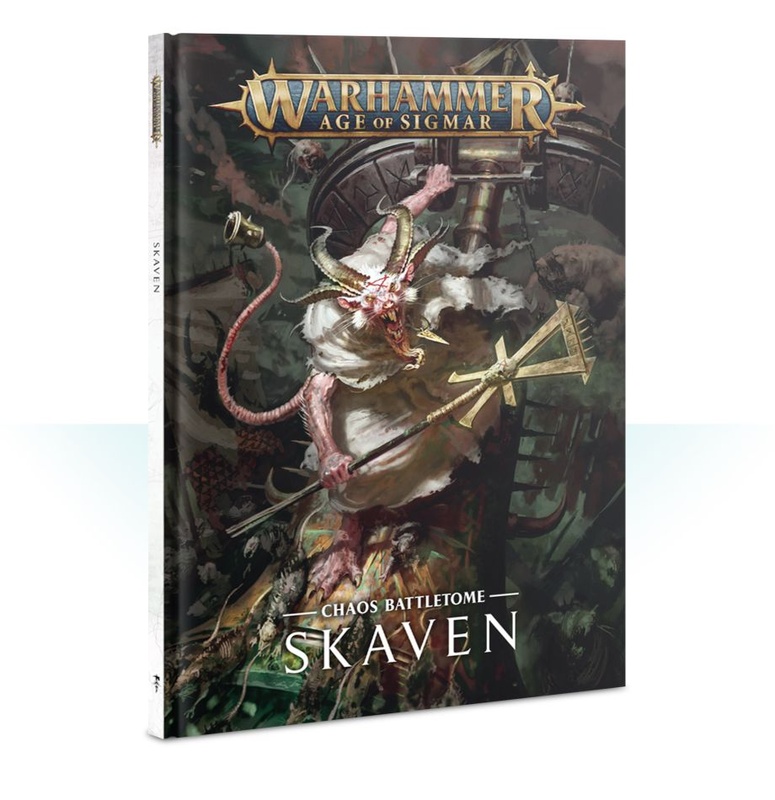 Then, from the darkness they come – the skaven have arrived to blight the Mortal Realms!Chaos Battletome: Skaven is your guide to the evil ratmen who gnaw at the very fabric of reality. Serving the Chaos deity known as the Great Horned Rat, these sinister creatures seek to undermine the Mortal Realms, conquering with raw cunning, overwhelming numbers, and strange inventions.In this 128-page hardback battletome, you'll learn about the history of the Skaven in the Mortal Realms – from their origins in Blight City to their role in the Soul Wars, all illustrated with stunning and evocative art. You'll also find lore on their many clans and the brutal inner workings of skaven society. The battletome goes on to cover how the skaventide goes to war, showcased by several warscroll battalions, and all the warscrolls needed to field a force of ratmen on the tabletop. You’ll be able to mix-and-match a variety of skaven clans to build a killer army to suit your tastes – slaying your enemies with endless hordes of Clanrats, blasting them apart with the terrible technology of the warp lighting-wielding Stormfiends, and unleashing vile monsters of arcane science like the Hell Pit Abominations. All are goaded into battle by the scheming, backstabbing members of the Masterclan!Battletome: Skaven lets you customise the leaders of the skaven with a selection of warpstone-infused artefacts and cunning sorceries. Their spells come from the Lore of Ruin, a collection of sinister curses, and the Lore of Warpvolt Galvanism, arcane arts that enhance Skyre units and incinerate your foes. The book is also a great resource for collectors, packed with examples of different colour schemes to inspire your own projects, as well as painting tips. The section on Path to Glory rules and a pair of bespoke missions are great for organising and playing your first games with this insidious army.This book contains:- Allegiance abilities for skaven, including a variety of battle traits – 6 separate types of artefacts of power and 6 types of command traits- 2 spell lores – the Lore of Ruin (for use by Grey Seers) and Lore of Warpvolt Galvanism (for use by Clans Skryre Wizards)- 2 battleplans- Path to Glory rules for creating a skaven warband for Path to Glory, including Champion and Followers Rewards Tables- 8 warscroll battalions- 40 warscrolls, 3 endless spell warscrolls and a warscroll for the Gnawhole scenery piece.- Pitched battle profiles for all units and Endless Spells featured in this battletomeIf you’re starting a new skaven army or bringing your classic collection into the Mortal Realms, this battletome is your essential companion.